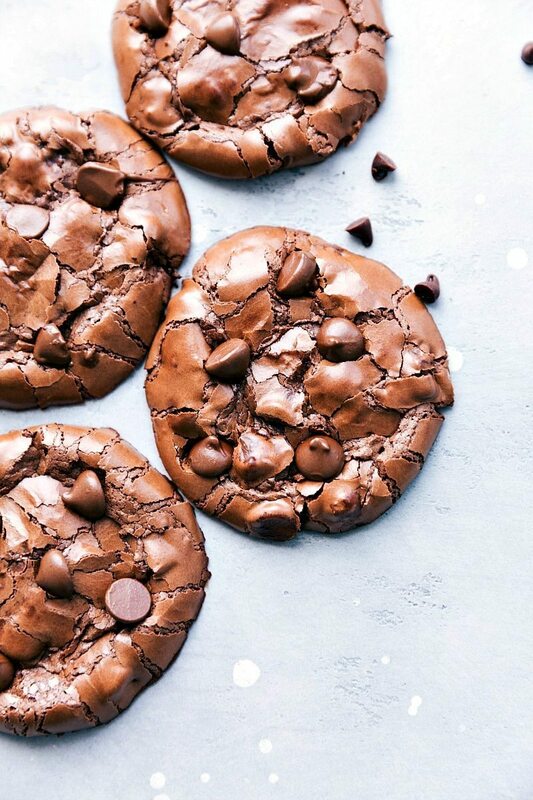 These flourless milk chocolate meltaway cookies don’t have any flour in them and instead the base ingredients are cocoa powder and powdered sugar. So you can probably imagine just how rich they are 🙂 Since there are so few ingredients you want to make sure you use a high quality good cocoa powder as that will make all the difference! 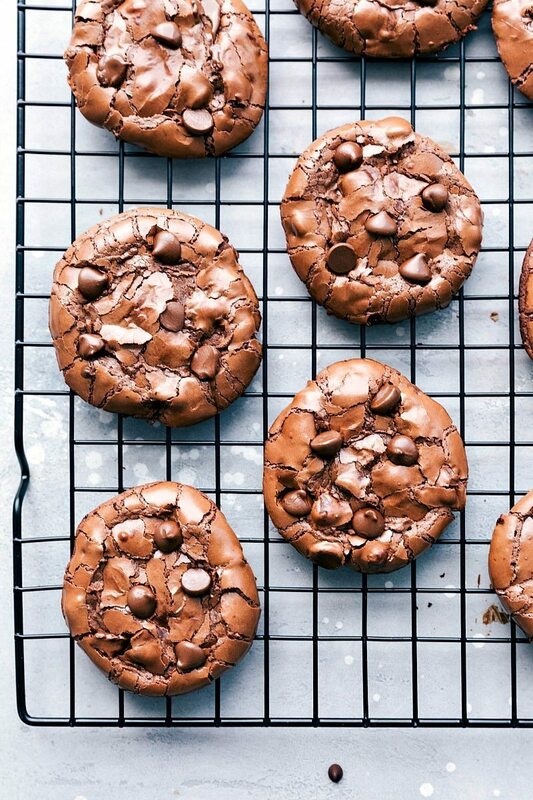 You’ll also want some good milk chocolate chips in these cookies. 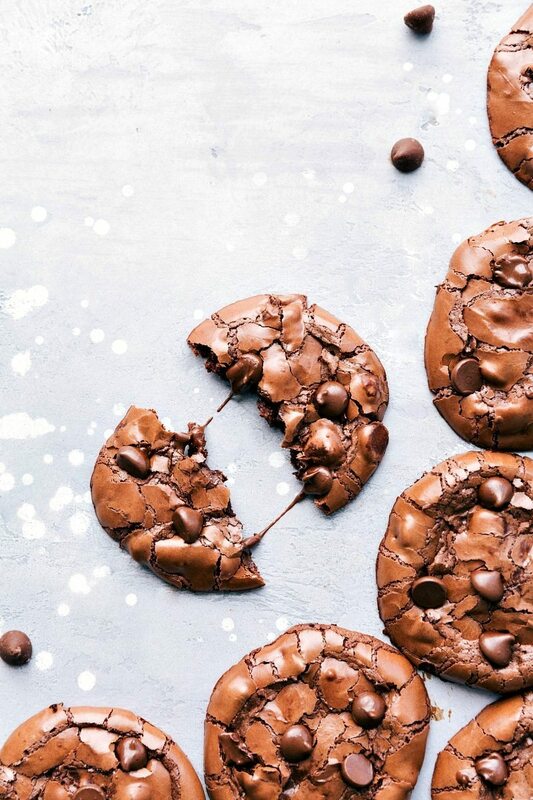 If you are worried about the sweetness, you can always substitute semi-sweet or dark chocolate chips. Measure carefully and precisely: make sure you completely level the measuring cups with the ingredients and get very exact measurements. Use only large egg whites. Add egg whites slowly. Start with just one egg white and mix for a while. If it’s not coming together, then add your next egg white. The dough is quite wet, but it should still be able to hold form into a loose cookie ball (as opposed to being straight liquid). 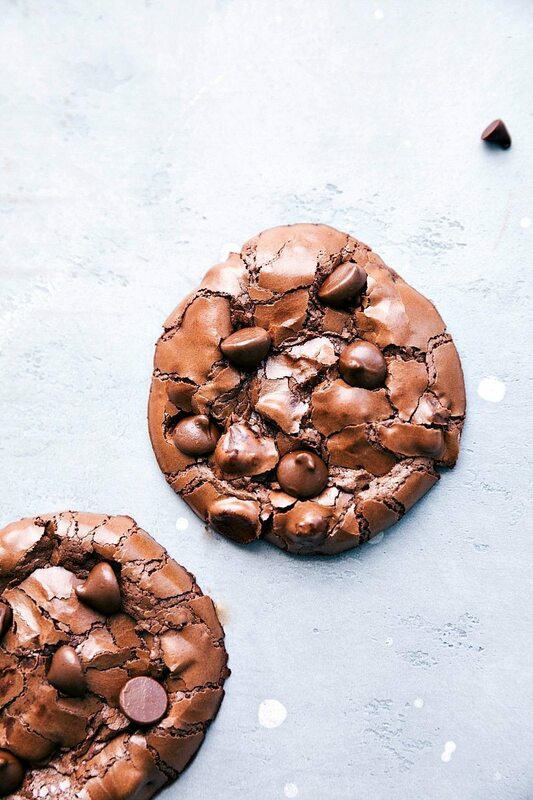 If the dough is too dry, add that second egg white and if it is still too wet (the cookie dough is puddling on the tray instead of holding form, add a few more tablespoons of cocoa powder until you’ve got a thicker dough. Use parchment paper or a silpat liner: this is an absolute must or you won’t be able to get the cookies off the tray. Let the cookies cool on the tray completely before removing them to a plate: these cookies need time out of the oven to set up. If you pull them off too quickly, they’ll likely crumble. Give them about 5 minutes on the tray out of the oven and they’ll be great! 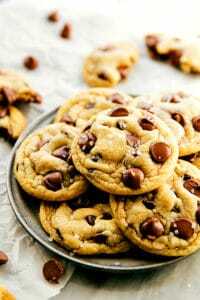 Test your cookies! Before baking a whole batch and potentially being disappointed if they don’t turn out, try one cookie first. 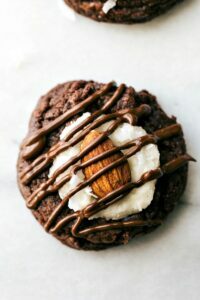 If you find it didn’t take form for how you wanted it (and how these cookies in the pictures look), you might just need another tablespoon or two of cocoa powder. 1/2 cup milk chocolate chips. Preheat the oven to 350 degrees F. Line a baking sheet with parchment paper or a silapt liner. Do not make these cookies without a lined tray. Add the vanilla extract, the egg white and whisk until you obtain a thick but moist batter. If it seems too thick, add another egg white. Fold in the chocolate chips. Chill in the fridge for 20 minutes. If the dough is too wet (it's quite wet, but should not be total liquid) add 1-2 additional tablespoons cocoa powder. Bake for 6-8 minutes or until the tops become glossy and they begin to crack. Let the cookies cool completely on the cookie sheet before removing with a metal spatula. Store the chocolate cookies in an airtight container at room temperature for up to 3 days. There’s no way I could hand beat for 15 minutes…lol…thank goodness for my Kitchen Aid! These look delicious! Oh my gosh! So crackly! These look amazing. I really want to make these to see what the texture is like. Love how fudgy they are in the middle! These would just melt in my mouth! Yum! These look fabulous, but I’m not a milk chocolate fan. Can a darker chocolate be substituted for the milk chocolate? Oh great! Thanks Lisa 🙂 You’ll have to let me know how you like them! These look to die for! I can definitely see how they would melt in your mouth. Hi Chelsea, these cookies look delicious. 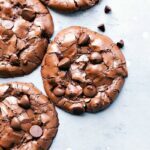 I’m a big cookie fan and I’m going to have to give this recipe a try – I can’t resist the yummy chocolatey goodness. Pinned! 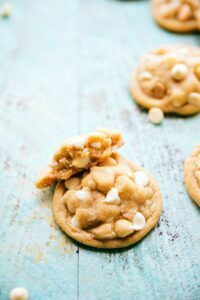 My mouth is watering just thinking about these cookies melting in my mouth! What a fabulous recipe, Chelsea! These were a hit and easy to make! My son n law loved them! Thank you for this awesome recipe. Thanks so much for taking the time to comment and let me know 🙂 I’m so glad you liked them! Happy New Year Ann! is there a shelf life for these amazing cookies? i’m in the process of planning a big event and would like to make what i can prior to the event, to cut down on catering costs. If there is a shelf life, can you suggest what the best storage method would be as well as the expected storage time, making sure they look and taste like they were just made. Unfortunately not a great shelf life. I’d say they are best the day of or day after being made. Good luck with your event! I made these, and they are really great! They aren’t difficult to make, but I had to watch carefully when making them. I used egg whites from three very small eggs, which seemed good. But then I had to add another tablespoon of cocoa powder to stiffen it up. They scooped and baked as planned. I want to try next time with powdered coconut sugar so it’s refined sugar free. Fantastic recipe! Ooh they would be great with powdered coconut sugar!! I’m so glad you enjoyed these!! Hey Chelsea: There is nothing like following the directions as written! I was not sure I could duplicate what you did so CAREFULLY did everything you said and they came out perfect! They are sooooo easy and soooo good – thank you so much! Glad I found you. hgz, b.